Sure number limiting yes... but located slots??? only for flavor like with Chakras. I think that the point of item slots in 4E was more focused on limiting than on balance, but that's not to say that balance wasn't a factor. I recall from early editions (like 1e/2e) that you could get bonuses from all kinds of different item types. So you could have magic armor, a ring of protection, and a weapon, and probably some boots and some gloves, all that added a bonus to your armor class. And your AC could get ridiculous from it. In 3.x, they introduced the "typed bonus" such that bonuses of the same type didn't stack, and that helped rein in the abuse. Also the concept of item slots started in 3.x (I believe, perhaps I'm wrong?) which put a bit of a limit to the total number of items a person could use at once. In 4E, there was a clear design goal to have the slots mean something other than "limiting the number of usable items". So neck slot items typically had bonuses to NADs, arm slot items gave bonuses to damage, hand slot items affected attacks, feet slot items affect movement, and so on. It wasn't perfect, but the theme was there. So in limiting a person to a single neck slot item, it gave them one item to affect NADs and kept the properties and powers into a particular thematic style. In 3.5, I remember the Incarnum rules. I absolutely LOVED them. And those rules named the "slots" as chakras. And each chakra had magic (I forget what they were called, bindings?) that went specifically to that chakra. It was a pretty cool system. And I have seen a 4E implementation of this (which is something that I would put into CBloader if I knew how). But I think that using some of the flavor of the Incarnum system of 3.5 would be a great way to implement magic enhancement in 4E. It provides a thematic system that is consistent and also works well with the intended 4E balance and limiting concept. Still keeping on here. Got a Campaign into EPIC for the first time recently! Also, started Recording a game for a Podcast and have hit about 30 some Episodes. Finally, I've been trying to make a more organized Offline Compendium for 4E using Print to PDF programs and a Folder based organization system. My PhotoBucket of Mostly minis that I have Mangled..I mean Modified and Painted. WARNING! I have a Sense of Humor and am NOT afraid to use it!! If you need any help with your compendium give me a shout - I've built a database - can easily query out any info you're missing in json or csv format. Or given a bit of time fudge it into html pages etc. Also, hit me up with the podcast liiiiinnnkkkkkk. One of the 5e previews had something I found interesting the number of magic items was tied to your Charisma.... With a charism sort of meaning a divine gift I found that intriguing. The 1e Paladin gave up freedom of magic items for inate gifts. With regards to the character builder - does the fact that it can export to csv mean that it can import from csv as well? I'm not really interested in getting the offline builder working, since I'm already invested in HL, but csv is something I can work with. The content would have to be pretty fully realized given CBloaders coverage. Str 10, Con 13, Dex 16, Int 13, Wis 19, Cha 8. Str 10, Con 13, Dex 15, Int 13, Wis 16, Cha 8. On that note, how far does the Character Builder's support extend? The stuff that's missing from HeroLab is pretty much down to the last releases (Heroes of Shadow is only partially there) but I have no idea how far CB got in the end (I stopped using the online version when I needed homebrew stuff - this was before the Loader's ability to add homebrew was much of a thing). The export format is indeed also importable, sorry wasnt clear. On that note, how far does the Character Builder's support extend? Its actually just a reflavoring of an existing spell with its internal-id changed to be unique but it should give you an idea. I believe that CBloader pretty much has it all. However, one issues I've run into is operating platform. I am primarily a Mac user. But at work I have to use Win7. So I have CBloader installed on both of my work computers and also in a WinXP partition on my MacBook. So I'm covered. But, two of my players are Mac only and one of them works from home and so his Mac is technically a work computer and he can't install a Virtual Machine on it. I've been looking for a Mac solution for the CB but been unable to find a viable one. I know that there is a Mac version of HL, but I don't know much about it and based upon the little I've seen on their forums, HL doesn't have all of the 4E material in it and running. So I haven't pursued it. But, I'd definitely be interested since it might provide a solution to my problems of cross-platform CB usability. So perhaps I should start a new thread on this topic to discuss and see if this is an option that would work? I'm just not a tinkering/programming/customizing person, so I tend not to dig into things that require me to do a lot of "fiddling about" with stuff. I'm a "point-and-click" kind of person, typically. Anyway, if anyone feels like discussing HL with me, let me know as I'm curious if it is a viable option for me. Unfortunately I can't make any real comment on Mac compatibility, as I've never had one myself. As you say, there are Mac and IOs versions, but I can't attest to how well they work, whether there's any weirdness with the community patches, and so forth. The biggest issue with HL is definitely the missing content. Nine times out of ten you'll be fine, but if your group really likes the later Essentials stuff, you'll notice the bald spots much more often (Heroes of Shadow, for example, is almost entirely missing - to my knowledge, the Blackguard patch I made is the only class from HoS that's currently active). Feat and item support is better, even from the later books, since that data was much easier to scrape successfully from the DDI compendium. Races are covered quite well, as are themes (since those were handled entirely by community contributors). I've got to run to work now, but I'll add more later! I have a database built from the DDI Compendium, there's potential to write a script to create the data you're missing that you can drop into HeroLab. I would definitely be interested in seeing if the patches will work for the Mac OS X version of HL. I don't know how it is assembled or anything (is it a database that the HL app references?). But if it is something that would work, then perhaps I can then see what can be done to get the last of the missing information into it. I'll have to find out how to install HL on Mac as well. I don't know how much a full licensed version of HL is, but I'd be willing to drop the cash if it will work. Hmm, I can send one of the patch files maybe? They have a unique extension but they're just XML under the hood, so if you know code I'm sure you can get an idea of how they basic info is put together pretty quickly. Getting things working mechanically is a separate issue though. For a lot of material, the text has been imported, but the mechanical effects are too complex to add automatically. I think that's why most of what's missing is Essentials class material - the original classes fit a predictable template very well, but Essentials classes are much more likely to have weird unique mechanics (like their own powers-by-level progression, for example). Anyway, I don't think there's a complete reference to the format anywhere, but I can probably help you out with examples, depending on what you need. Also, this leads me back to the other caveat I was going to add this morning, before I had to catch my bus - most content is available in HL, but there are still plenty of scraper errors. Mostly they are in the form of dropped power triggers (which could definitely be done with a script) but there are more complex offenders, like two-in-one type powers (think Warden guardian form powers, conjuration spells, and similar powers than combine a non-attack and an attack power into one), as well as just a bunch of feats/class features that don't yet have appropriate scripts associated with them. This part is pretty nice! HeroLab comes with an editor GUI (ugly but functional), which produces custom content in the form of ".user" files (just renamed xml). You drop them in a specific folder (in Windows it's under ProgramData, but I'm not sure where it goes on a Mac) and HL loads them after official content. If you're making patches, you include tags in the user file telling HeroLab which items from the core files to overwrite. Unless there's a huge difference in how they built the Mac version, I can't see a reason why user files wouldn't work as expected. That said, however, the Themes patch is a bit more complex than just being a user file, so if anything was going to trip it up, that's be it. In any case, you should be able to find out from the trial version if it will work for you. IIRC, you can download whichever system you want for trial, and add custom content no worries - you just can't save any characters made under a system you haven't paid for. Yes please Fox, send me a file and I'll see if I can figure something out to generate matching output from the raw data. If it turns out to be ridiculously easy then brilliant, if it looks impossible then we've only lost a few minutes, and somewhere in between it'll be a fun project for a rainy afternoon. Been busy myself with it being the end of January and having to survive encounters against roving bands of max level Accountants and Tax Returns. 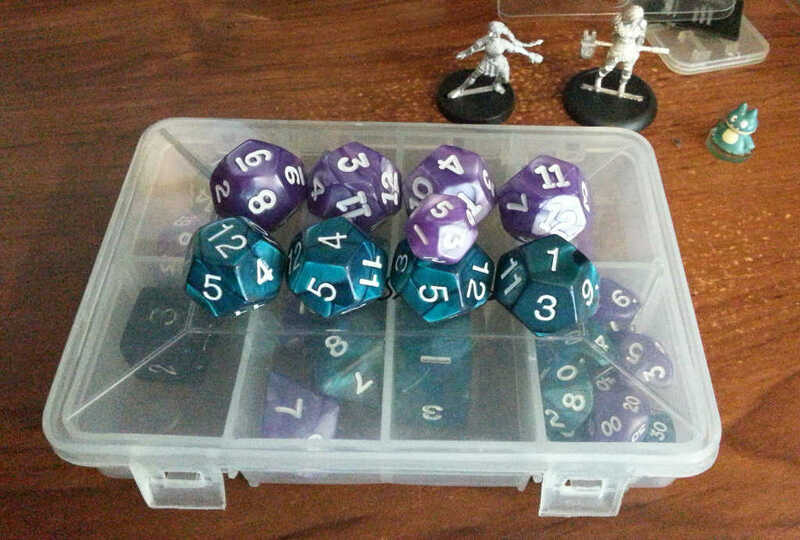 Cancon trip yielded a long-awaited boost to my dice supply. Yeah, it's true that 4E allowed everyone to roll the dice! And I do like how implements were... implemented. And I especially like the classes that have weapon/implements. In my current campaign, there is an Artificer who uses a superior crossbow. I love the idea that he makes attacks and channels his arcane magic all via this single thing. But to be fair, back in 3.x, I played a Halfling Fighter/Rogue/Duelist. On a full-round attack action, I was making 5 attacks (3 main-hand, 2 off-hand) with my dual short swords. My main-hand short sword did 1d4+10 and off-hand did 1d4+6. Plus, one of those typically got my Sneak Attack damage (I think I only had 2d6 because of my multiclassing shenanigans). But it was a LOT of dice rolling for my little "pincushion" character. Yeah, my pincushion wasn't a common thing for martial-types in 3.x; although it was a lot of fun. I had some feats that pushed up my AC against opportunity attacks and a really high Dex, so when the combat started, I usually went first. So I'd double move across the battlefield, zig-zagging in and out of the enemies, pulling the OAs from them. With my high AC (+8 vs OAs), they rarely hit. Then, since 3.x only allowed one OA per round, it left the rest of the party free to reposition themselves fairly readily. And if I was in a bind and separated from the party, I had a super-ramped-up tumble and a feat that let me tumble through enemy spaces, so I could get back fairly readily. The main thing was me getting around the big-bad and setting up a flank for the single-class rogue in the group, who had Improved Crit and d8s for his Sneak Attack (which was something like 7 or 8 dice). When he connected, it was almost always a kill. It was kind of ridiculous, really.